Gerber axes, like all of our products, are built to face down challenges. Taken along on a camping trip or applied for use in the yard, the Back Paxe II is light in mass and tough in the blade. 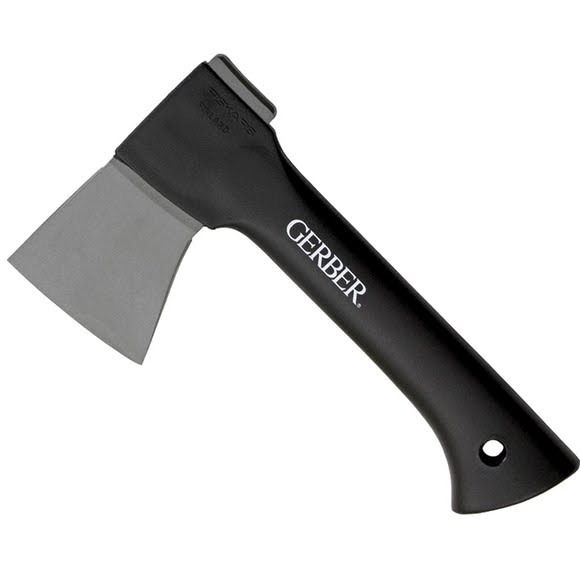 Gerber axes, like all of our products, are built to face down challenges. Taken along on a camping trip or applied for use in the yard, the Back Paxe II is light in mass and tough in the blade. Featuring an innovative easily-removed sheath that still maintains a slim profile and stores neatly within the handle, the Back Paxe II serves its owner with the excellence that modern technology and good steel have combined to deliver. A portable, compact axe, the Sport Axe II combines light heft and an ultra-sharp blade known for its edge retention. Its size makes it ideal for splitting medium-sized and smaller logs. With a low-friction surface coating, the hardened forged steel blade of this axe slices through wood at a depth that is three times greater than average, allowing for faster chopping and maximum overall performance efficiency. The coated surface also prevents the blade from sticking in the wood, and its high-capacity potential prevents body strain. Possessing a shock absorbing handle that helps in prevention of overstrike injury, the Back Paxe II offers great grip and superior hand control. Balanced perfectly for exertion-to-weight ratio, this lithe little axe swings with a solid, easy feel. Its hardened forged steel blade, in conjunction with the unique grind technique engineered for a sharper edge, will make sharp, clean cuts for far longer than average, making this an intuitive kit axe for camping and beyond.